Rarely has one musician put down such a strong start as the guitarist originally from Paris, called U-Nam. Out of nowhere, he surprised the connoisseurs of smooth jazz scene with his albums The Past Builds The Future (2005), Back From the 80’s (2007) and Unanimity (2009). What unites all the albums is U-Nam’s ardent admiration for the master of Smooth Jazz George Benson. It begins with the partial selection of songs like Breezin’ M.A. or Mister GB and ends with the choice of his instruments Ibanez Guitars. What could be more than nails to do the job and create the ultimate tribute album Weekend In L.A. The album was in the air with thunder inspired by his visit at Benson’s home being invited by his buddy Robbie (one of GB’s son’s) and his impressions he talked about in an interview lately. U-Nam has cut the umbilical cord of the record companies and funded his new project via Pledge Music. The album includes a mega-all-star line up of artists and musicians including but not limited to George Duke, Marcus Miller, Paul Jackson Jr, Phil Perry, Patrice Rushen, Stokley Williams ( Mint Condition ), Tim “TiO” Owens, Wah Wah Watson, Andreas Oberg, Michael White, Dio Saucedo and many more. The Deluxe Edition offers 15 songs and lots of bonuses with alternate versions. The CD was recorded live at Yoshi’s Jazz Club in Oakland, CA on Jan 28th, 2018. This is the celebration of the 10 year Anniversary of Tequila Moon. I’m excited to commemorate this experience with my fans, they have the opportunity to be heard and seen on the Live CD and videotaping of this exclusive show. The setlist will feature classics from her catalog over the past ten years including #1 hits Tequila Moon, Tropical Rain, Hot Sauce and brand new material. The album will be released April 2, 2018. Jazz artist Dean Krippaehne is a veteran songwriter, musician, author, visual artist and Film and TV music producer. His music has been heard on hundreds of TV shows, Film and New Media around the world including; Oprah, Late Night with Seth Meyers, Scorpion, Cris Rock’s Good Hair, Duck Dynasty, Parenthood, The Today Show, Vampire Diaries, House of Lies, One life to live, Say Yes to the Dress, T-Mobile and Amazon Connect to name a few. He has also earned gold and platinum records as a songwriter and has decades of experience in the music industry founding both Seattle’s Tri-West Recording Studios and All Screen Music as well as co-founding the advertising company Spektrum and partnering in the Tech company NXT CHNL. Smooth Jazz (Vol. 2) is a collection of grooves written, recorded, performed and produced by Dean Krippaehne at Seattle’s Tri-West Recording studios. It’s the follow-up to Smooth Jazz (Vol.1). This album was released last week on CDBaby. The Columbus, Ohio based formation Urban Jazz Coalition was founded by bassist Phil Raney. Further members are percussionist Hector Maldonado, keyboardist Brendon Howard, saxophonist Richard Randolph, drummer Rich “Rico” Adams and guitarist Duane Tribune. Keyboardist Brian Skeel joins the group on the new recordings. 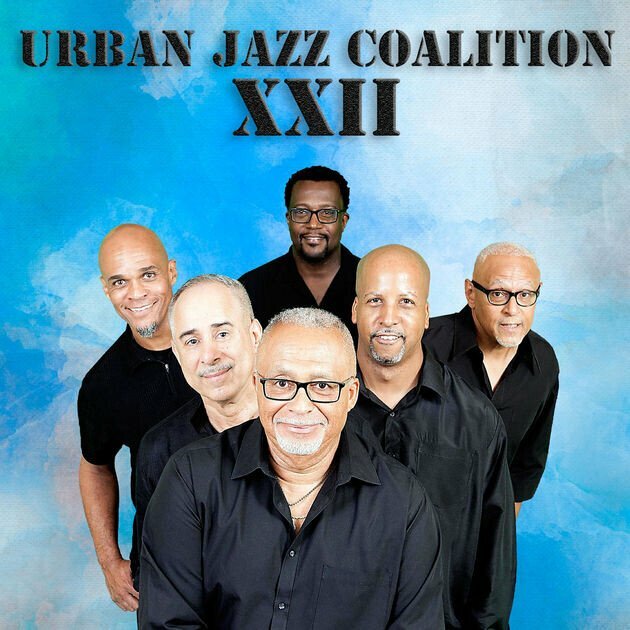 This album is entitled XXII (2018), what means no more or less than the group has already played together since 22 years. Their website has little information about their earlier works. We already reviewed their albums Contempo (2002), Into The Night (2003), and Long Street (2004). Further albums are Down To Get Up (2006), A New Day (2008), Gravitate (2010) and One Step Closer (2013). Lindsey Webster is the first vocalist to score 4 #1 Smooth Jazz radio hits in a row and was recently named the #1 Billboard Smooth Jazz Songs Artist for 2017. She’s been on the Billboard Contemporary Jazz chart for an amazing 60 weeks. Her swift rise has been nothing short of spectacular! Love Inside promises to be Lindsey Webster’s breakout album. The album’s first single, “Love Inside,” is quickly following the suit and making it’s way up the chart!. Other highlights such as the sensuous “It’s Not You, It’s Me” (featuring Rick Braun) and the soulful “Free To Be Me” (featuring Norman Brown) help make Love Inside a must have release for Lindsey’s growing legion of dedicated fans! Love Inside (A Shanachie Entertainment release) can be pre-ordered on Amazon.com. “Jazz Group of the Year” nominee, The Lao Tizer Band, present their long-awaited new album & film (CD & DVD combo-pack)! This epic project was recorded all “Live in the Studio” at famed Conway Studios in Hollywood, CA with an all-star cast of musicians! Produced by former “Best New Jazz Artist” nominee keyboardist, composer and bandleader, Lao Tizer, the project includes 11 breathtaking Jazz-Rock-Fusion tracks featuring 7 new original instrumentals, and for the first time, 3 vocal covers (CD only) of Led Zeppelin, U2 & Cat Stevens, all documented in simultaneous 8-camera array of HD video under the direction of acclaimed music film director, Andy LaViolette (Snarky Puppy, David Crosby). Recorded, mixed and mastered by Grammy nominated engineer, Paul Wickliffe (Kevin Eubanks, Special EFX), the recording captures the dynamic range and energy of this touring juggernaut. This project will be released March 16, 2018.